Blended learning, personalized learning, project-based learning, student-centered learning – there are so many terms but what is the difference and overlap between them? 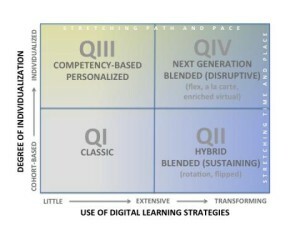 Andy Calkins shares a quadrant graphic model to make sense of current reforms in the education-innovation space around four main degrees: time, place, path, and pace. Calkins gives examples of all four types of innovating; the most disruptive innovations push all four dimensions. Where does your work fall on the chart?